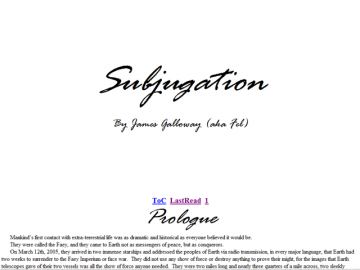 Subjugation is a story that centers around Jason Fox and Jyslin Shaddale. The Faey, an alien telepathic race, has taken control of Earth and are using it as a farming colony to supply food for their empire. Jason is a college student who is learning faey technology, but is upset with the faey and their treatment of Earth. Along the way, Jason meets a fiery red head name Jyslin, who takes a fancy to him and will not take no for an answer. There is a problem though. Jyslin is a Faey Imperial Marine. And, marines are not easily deterred. . .
Subjugation has not been tagged yet. Help others find Subjugation by tagging it! I have mixed feelings about this story. On one hand, I have a laundry list of dislikes about it. On the other hand, I did read through the whole novel (although I was skimming some toward the end) and I don’t regret doing so. The result is going to be a long review. The short version: don’t be afraid to read it, but certainly not a favorite of mine. Subjugation has not been recommended yet.